John Novosel Jr. has worked and consulted with golfers of all abilities – including Major Winners on the PGA Tour, LPGA Tour Players, Nationwide Tour Players, and also top amateurs through beginners. His teaching puts an emphasis on the golfer achieving a consistent Tour Tempo® and maximizing clubhead speed at impact. To achieve this he utilizes his extensive experience with the Tour Tempo® training tools and optimal biomechanics. At age 49 and despite being under 170 pounds, he can generate clubhead speeds over 130 mph and ball speeds of 190 mph. 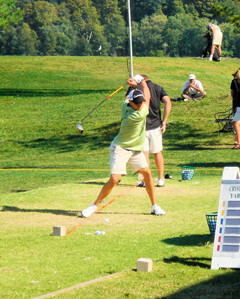 He has competed in World Long Drive events, his longest drive in competition is 402 yards.